15 one-minute shorts created by various people from Japan's animation industry. The title of the collection, Ani*Kuri15, is abbreviated from the words "anime" and "creators". 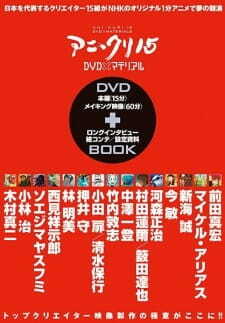 15 animation personalities of different anime studios are given 60 seconds to animate something and were compiled into this small movie called Ani (Animation) Kuri (creators) 15. These shorts were shown between commercials in NHK channel and it's other channels. Regular animation here and a cute story based on anime most used themes. A little princess turns into a magical girl and defeats a power rangers like villains and the final boss with the help of her doll. Yoy can feel Range Murata in it even though it was fully made in 3D. This doesn't had a story so to tell. It showed the so called Gyrosopter and a a girl looking at the water reminiscing about. This one was pretty good, the animation well done and it was pretty effective, it was perfect for the movements required at a amusement park . This one was more like a music clip, showing a girl near a window crying and remembering perhaps a friend and happier days of the past. Oshi's done it again, whenever he does something short these days he goes into this direction. He presents us with a very modern approach of an animation even converging with real pictures of a woman to do the mermaid. It ends becoming a pretty good short movie. And the actual last two seconds of it, makes you want to learn more about that story. The most weird so far. We see a big green field with children happily playing on it, but then there appears this big robot like the Miyazaki's Castle in the Sky robot, walking around. A child stares at it without fear as the other children runs along with it. This one was an excellent piece from Mr. Satoshi Kon. It deals with the process of fully awaken in the morning. This one is animated in basic sketch like black and white. Despite being so simple, it is a huge fun. It is shown to the viewer like it was some scenes or episode in the middle of a samurai story about this colonel that lives in the mountains with his pets but must leave everything behind because he's being targeted. It was a very funny short. Very good Shinkai short. It's about how a cat gets fed up about the humans always stepping on his tail and eventually does a "gathering of cats", where all the cats in the neighborhood assemple together and take revenge on humans. The next day, it happens all over again. This was very different from what shinkai usually does, but not less good. Very nice short, with a little robot distracting a guy on his desk when this one was calmly reading a manga, it looks like the little robot is playing with the guy. The character design here is like Mind game. A guy is trying to animate a scene in it, and you actually see the drawing being born and process of it. You also see the guy, well not see but it's more like in first person animation. see the guy also going to the bathroom and in the return trying to play a joke on a co-worker by messing with the keyboard that the co-worker was typing (I found that scene hilarious, because I usually did the exact thing too). In the end you see the animation complete. Interesting point is that he has the drawing upside down. It's Kawamorui time so you can expect mecha here, even if it's a one minute mecha anime. A comet is about to collide with earth, and when the announcer of NHK news announces that the colliding point will be NHK there are measures to be taken. The whole building of NHK transforms into a huge mecha to stop the comet, the problem is that it needs more power. Another total CG piece here. A group of Native attacks a beast, or whatever it is. total CG in Gonzo vein, the worst of the bunch. CGI animation again but done differently. This one was fun. Three little alienes arrive on earth to conquer it, when they approach someones house speaking of their plans of conquer throught he intercumunicator, the person on the other side just tells them that she doesn't need it, confusing them by some seller. An record store owner watches their supposed clients coming to his store but most of them don't buy anything for the store owner sadness. Some directors were able to accomplish their tale or their message in it's 1 minute story, but some weren't able to do it, afterall, it's pretty difficult to come up with a finished product in only one minute. It was a great watch never the less. Rate: 8.0/10 very good stuff. Aki*Kuri 15 is an anthology movie consisting of 15 one-minute short films, each directed and produced by different animators in their own styles. Many big names are featured here, and there's no other relation between the shorts. In that case, a generalization would be undescriptive and pointless. Here's my full rundown. In a sci-fi infused feudal Japan among the likes of Ganbare Goemon and Gintama a princess transforms into a super powered girl to fight off an impending evil army. The short is a nutshell parody of comedic action anime with fast animation that hyperbolizes many old tropes. It's funny enough for its one minute. An entirely 3D CG short. The CG is mediocre but the aesthetic is astounding. This has no apparent story to tell. A vocal song plays as a girl flies through the air and over an ocean on a magical stone copter. She lands on the base of a large stone structure in the ocean that looks of a similar build to her copter, and the surface is a very thin disk full of shallow water. She touches it, then takes off as a bunch of other copters do the same in the background. It's entirely unclear what the narrative is here, but I loved the mystique of it and the surrealistic fantasy art style. Captured my imagination and got my attention emotionally just for that. Reminds me of late 90s video games. Cute. A little boy sets up a Rube Goldberg machine to land him right in front of his little girl crush for a kiss. She slaps him but then feels pity for him and kisses him for real. This is another feudal Japan-styled short and the even the contraption is entirely wooden. The animation quality is the smoothest so far and the watercolor paint colors give it a childish ink painting look. Another music paired short that depicts three separate women that appear to each be going through a painful break up, but cry their heart out and feel better by the end. Nice visual distinction in age difference and response here. The youngest looking one cries in public at one point, the teenager cries alone in her house, and the adult is never shown crying even in a scene where she’s dejectedly looking away from the camera. Otherwise nothing special. Now for one of the biggest names on this list. Oshii does the most surrealist piece so far, using fluctuating still photos of real Japanese women on a mermaid that appears flat from all angles. It dives through an unclear blue and gold space filled with miscellaneous symbols. At the end she escapes through a portal labeled “REAL” and breaks apart upon entering a city-like landscape. This sequence has a similar feel to the cyberbrain diving scenes from Ghost in the Shell. Though visually creative it’s a very static aesthetic that almost entirely reveals itself even before the sole minute is up. A little disappointing. Cool music. An open field of mostly children that are happily running alongside a giant robot that seems to pace without regards to them. Impressive breathful ambiance, but one of the least interesting shorts. And here’s my reason for admission. With Satoshi Kon’s untimely death any fragment of his legacy is now a treasure to his fans, of which I am one of. Even more tragically, this short is the last thing Satoshi Kon ever finished. He passed away just about three years later. And yet, this follows his more whimsical works in which a young woman wakes up and goes about her morning routine. Different visions of her split apart and complete different activities before uniting in the end to show an awake woman prepared for the day. The visions walking around the screen performing different activities in the same frame is a great method to optimize the one-minute time and are combined with some of Kon’s peak quality animation. The premise is extremely simple but the techniques elevate it a bit further. Not enough though in my opinion, as I think the vision idea is played up too little and more could have been shown happening on screen with the same concept. Instead we mostly just see two. A modest and decent idea, but just fairly pleasant in execution. Surprisingly, the most eccentric short yet. An almost entirely black-and-white short drawn like a rough manga sketch. The Colonel is in the mountains hiding from his enemy Paul, who will one day assassinate him. The narrator tells us the Colonel will not bring harm to the animals that raised him, and jumps in a river to escape the area. Just a silly short with a cool art style. There’s always a cat one. A house cat gets sick of having its tail stepped on by its human owners, and escapes to a legion of other cats who plan to form themselves into a giant cat and attack a city with laser eye beams. At the end, the house cat is distracted as usual and calms down after getting some food. It’s the most sensible comedy so far about the cold and affectionate duality in cats. Perfectly effective. An oblivious manga artist is pestered at his desk by a little robot clinging to the side. This entire short takes place in one frame and has a jagged art style similar to Masaaki Yuasa’s works. It’s likably eccentric but little else. A more down to earth look at another manga artist’s desk life. He begins a sped-up sketch, takes a bathroom break, attempts to play a joke on his coworker, and then finishes and inks his page. Very charming. Kawamori of Macross and Escaflowne fame naturally goes for a mecha short. A UFO is detected to land on the NHK skyscraper which then transforms into a giant robot that attempts to stop it. It ends on a cute cliffhanger ending as the robot is failing to prevent the UFO from landing. Surprisingly, this is one of the most impressive shorts in regards to content. The frames switch very frantically and there’s a lot of detail packed into the background of every one. Even Domo-kun makes an appearance. Frantic and exaggerated in that camp way many mecha fans are used to. Another CG film where a tribe does battle against a shadowy bear-like monster. While scenes shift to a tribe in a hut performing some sort of ritual, one of the men facing the monster transforms into the titular Heat Man and bears his flames against the monster as the short abruptly ends. Though heavily stylized and more impressively animated than Gyrosopter it’s still crude in some areas (particularly the faces), and the frames are packed with so many colors at such fast speeds that it all spills into sensory overload that doesn’t give a particularly good impression. Still, it’s kind of cool and some of the art style reminds me of Team Ico’s mix of folklore and fantasy. The last CG short opens with the tone of an old sci-fi epic as a giant UFO moves in to invade Earth. Then we’re told that the broadcast has to show simpler images due to its budget, and the style shifts to something much more cartoonish and crayon-like. Three adorable little aliens that look like bootleg Dr. Mario viruses arrive on a portrayed Earth where the clouds are wooden cut-outs hanging off of wires. Very cute style, and one of the most enjoyable for that reason alone. A record owner becomes frustrated by endless window shoppers who leave without purchasing any albums. It’s easy to empathize if you’ve ever known someone struggling to run a record store, as this is a very real problem. I think a more melancholic tone would’ve benefitted this subject matter, as it is something of cultural gap and lack of appreciation for physical commodities. There’s something to be sad about here, but the wild art style and goofy facial expressions aim for humor. Again though, the style is excellent. With such a wide variety of narrative and aesthetic styles on display here, opinions will vary greatly on which of these shorts are the most interesting. I won’t bother to give any further thoughts other than the ones I gave above, because these probably won’t be picked out by anyone to watch in isolation anyway. Ani*Kuri 15 is a relentlessly entertaining watch due to its broad dynamic range. Although fairly shallow beyond that entertainment value, almost anyone will have a director of note to them among the featured names. The rest is a serviceable introduction to unfamiliar auteurs which makes this anthology a fairly useful tool. One minute is often all you need to get a taste of someone’s stylistic and writing preferences, and for that Ani*Kuri 15 is both a fun journey and an intriguing one. It's a great way to spend a mere fifteen minutes. Anikuri 15 was something that showed up on an accidental search and I stumbled across it. And long behold I was quite happy with the outcome, because what I had come across was a showcase piece of some of the most talented artists in anime in which each one puts together a 1 minute short to see how fast they can create an atmosphere, a character that people can connect with, and a story or work of art that people can understand. It was quite a fascinating piece, and although I would've wanted more character development and story, for god's sake man, it one minute an episode. Overall I sincerely enjoyed this series, and if you are looking for something short, sweet, and includes the work of artists like Satoshi Kon, Makoto Shinkai, and Shinji Kimura, pick this sucker up. You will be humbly pleased. This review only covers each short, not the entirety of the work. With creations like these, it is hard to review the work as a whole. So I will dissect the work into 15 parts. The Secret Princess (5)- This might appeal to people who like very random things like Lucky Star. True, this whole 15 minute series is random in general, but this short is especially so. Art is average at best, sound is more of a late 80's to mid 90's retro sound. Too random for my taste, but others have rated it higher. Gyrosopter (7)- I'm not a huge fan of CG anime, but I liked this one. Not much of a story, even compared to some of the other shorts, but I really enjoyed the music. If you have read any of my other reviews, you will have discovered that sound is often a make or break point for me. Amusement Park Kiss (7)- I enjoyed the little sound effects accompanying the movement. Not anything really high quality, but it contributed to the fun factor. Pretty high entertainment value for this viewer. Cute too. Not really the art style I usually enjoy, but that didn't disrupt the overall fun aspect of the short. Beyond the Tears (8)- Once again the soundtrack (a whole one song) won me over, but there was also a small story behind it too. I won't lie, I didn't really understand it. My interpretation was that it was about many girls having a bad day and suffering, so they are crying. However, it ends with a smile showing that the rough times won't last forever. For one minute it had a nice story. Project Mermaid (9)- The background artwork was refreshing. The soundtrack was nice and fit the setting, but for once it was the art that one me over. I didn't like the use of a photo of a real person for the mermaid personally, but I have to admit it was a direction few animators take. Very impressed with the background art for the most part, and even more so for the last few seconds. Did I mention the artwork? Frolicking (6)- The background music used wind instruments as a focal point. That was refreshing, but the children's screaming as they... well as they frolicked, was too strong and overpowered the music. Good Morning (8)- I really appreciated this portrayal of morning. When you wake up you feel sluggish like you aren't quite awake yet, right? This short separated the character into two. One that is what she is actually doing, and the other is doing the same things but it takes her longer to get started. Once she's awake and alert, both parts join. Very cool concept, and you have to love Satoshi Kon's art style. For once not much to say about sound. Pretty average music, just with the tiniest touch of Satoshi Kon's usual accompaniment (slightly warped instrumentals). Sports Colonel (4)- Don't take this rating to seriously. The short didn't leave much of an impression on me so there's not much for me to say about it. Some people seem to have enjoyed it. A Gathering Of Cats (9)- Shinkai's art has always held my interest. Another of my favorite animators, I could rate this a 6 on art alone. The sound effects were done well enough, and the music fit the scenes. So lets bump it up to a 7. Now add the enjoyable hi-jinks of indecisive household cats, and you have a nice shiny number 9. Seriously though, great humor! Alien Invasion - Hiroshi's Circumstances (7)- As far as my favorite topic of sound, the sound effects were a blast. I enjoyed the emphasis each sound effect had, and it really added to this short experience. The art was unique, although it wasn't something I particularly enjoyed, I can see others liking it readily enough. The only complaint I have is that not much happened as compared to the other shorts. It took a little too much time with each action, and so it felt shorter somehow. Yurururu ~Daily Chapter~ (10)- The casual jazz music was a lot of fun, and seeing the animation process was very interesting, specifically to me since I love learning more about the production of animation. There was great humor in it too, especially when he tried to play a joke on co-worker. "Joke"..... "Aborted". This was my favorite of the 15 shorts. The problem with reviewing these is that every person has a differing opinion on anime, art, and production... and each of these are very different in those regards. Project Omega (5)- Not much to say about this short. As a whole, I wasn't particularly impressed, but it had some of the best comedy in these shorts. Heat Man (3)- Gyrosopter's CG was simple, but clear. This was blurry and the animations weren't as fluid as they seemed. While at first glance there may be a sense of great CG, it shouldn't take more than a second to see how unfortunately ugly this short is. Attack of The Azuma Area #2 (6)- Music matched the silliness of the short, and the sound effects were good enough. The art design was clever too, but I just couldn't like this. I really wanted too, but something was missing. Sancha Blues (10)- The actual speech by the characters flowed casually like a real conversation between two people, and despite what people may believe, that is actually a hard thing to accomplish in voice acting. There were references to actual music groups as well, and while I don't listen to them, it was a good cultural touch. I like the animation and art style here too, and all in all this came in a close 2nd to Yurururu. One of the better ways to pass 15 minutes.